the establishment of Kenton Co. 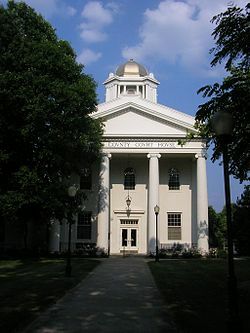 Independence is a home rule-class city in Kenton County, Kentucky, in the United States. It is one of its county's two seats of government. Independence is a suburb of Cincinnati, Ohio, and the population was 24,757 at the time of the 2010 U.S. census, up from 14,982 at the 2000 census. The current mayor of Independence is Chris Reinersman. Independence is located in central Kenton County at 38°57′13″N 84°32′49″W﻿ / ﻿38.95361°N 84.54694°W﻿ / 38.95361; -84.54694 (38.953668, -84.546990). It is bordered to the northwest by Elsmere, to the north by Erlanger and Covington, and to the northeast by Ryland Heights. The western border of Independence follows the Boone County line, and the city of Florence in Boone County borders the far northwestern end of Independence. The original center of Independence is in the southeast part of the city, along Madison Pike. Kentucky Route 17, a four-lane divided highway, passes just east of the city center, leading north 11 miles (18 km) to downtown Covington and south 27 miles (43 km) to Falmouth. According to the United States Census Bureau, Independence has a total area of 17.70 square miles (45.83 km2), of which 17.44 square miles (45.16 km2) are land and 0.26 square miles (0.67 km2), or 1.45%, are water. Banklick Creek, a northeast-flowing tributary of the Licking River, is the largest stream in the city, draining most of the area within the city limits. The area post office was established by Isaac Everett in 1837 as "Everett's Creek"; in 1838, this was changed to "Crews Creek" (presumably after the present Cruises Creek that is south of the city); in 1839, Thomas Hordern renamed it "Bagby". In 1840, Kenton was formed from Campbell and Boone counties. Local farmer John McCollum donated a site at the center of the new county to be its seat of governance, and the name "Independence" was chosen to honor the liberation of locals from Campbell County. The post office was renamed the same year. Quickly settled, Independence was formally incorporated by the state assembly in 1842. Because the majority of the county's population resided along the Ohio River, Independence was eventually obliged to share its status as county seat with the larger city of Covington, a situation later repeated in Campbell County between the centrally-located Alexandria and the larger, riverside Newport. As of the census of 2000, there were 14,982 people, 5,181 households, and 4,149 families residing in the city. The population density was 893.2 people per square mile (344.9/km²). There were 5,391 housing units at an average density of 321.4 per square mile (124.1/km²). The racial makeup of the city was 97.20% White, 0.96% African American, 0.18% Native American, 0.40% Asian, 0.02% Pacific Islander, 0.36% from other races, and 0.87% from two or more races. Hispanic or Latino of any race were 1.15% of the population. There were 5,181 households out of which 44.9% had children under the age of 18 living with them, 62.9% were married couples living together, 12.1% had a female householder with no husband present, and 19.9% were non-families. 15.0% of all households were made up of individuals and 3.4% had someone living alone who was 65 years of age or older. The average household size was 2.89 and the average family size was 3.21. In the city, the population was spread out with 30.4% under the age of 18, 9.2% from 18 to 24, 35.3% from 25 to 44, 18.5% from 45 to 64, and 6.5% who were 65 years of age or older. The median age was 31 years. For every 100 females, there were 101.6 males. For every 100 females age 18 and over, there were 97.3 males. The median income for a household in the city was $51,002, and the median income for a family was $55,030. Males had a median income of $39,213 versus $26,807 for females. The per capita income for the city was $20,191. About 5.4% of families and 6.5% of the population were below the poverty line, including 9.2% of those under age 18 and 4.2% of those age 65 or over. Major employers in Independence include Balluff, Cengage Learning, Krauss Maffei, Mazak, and Rotek. Independence is served by a branch of the Kenton County Public Library. * Some members of the community are districted for Woodland Middle School and Scott High School as well. ^ "Summary and Reference Guide to House Bill 331 City Classification Reform" (PDF). Kentucky League of Cities. Retrieved December 30, 2014. ^ a b "Geographic Identifiers: 2010 Demographic Profile Data (G001): Independence city, Kentucky". American Factfinder. U.S. Census Bureau. Retrieved March 6, 2019. ^ a b Rennick, Robert M. (1987). Kentucky Place Names. University Press of Kentucky. p. 148. Retrieved 28 April 2013. ^ Collins, Lewis (1877). History of Kentucky. p. 420. ^ Commonwealth of Kentucky. Office of the Secretary of State. Land Office. "Independence, Kentucky". Accessed 29 July 2013. ^ "Mazak expands, renovates in Elsmere". cincinnati.com. Retrieved 13 April 2017. ^ "William E. Durr Branch". Kenton County Public Library. Retrieved 24 February 2018. ^ "Beechgrove Elementary School". Retrieved 2018-07-06. ^ "Community Christian Academy". ccaky.org. Retrieved 13 April 2017. ^ "Kenton Elementary School". Retrieved 2018-07-06. ^ "Summit View Elementary School". Retrieved 2018-07-06. ^ "Summit View Academy". Retrieved 2018-07-06. ^ "Twenhofel Middle School". Retrieved 2018-07-06. ^ "White's Tower Elementary School". Retrieved 2018-07-06. ^ "independencefire". independencekyfire.org. Retrieved 13 April 2017. ‡This populated place also has portions in an adjacent county or counties. This page was last edited on 6 March 2019, at 14:18 (UTC).